Having your iPhone handy while on the road often requires a complicated set of docking accessories or a variety of cables, adding more hardware to your dashboard than you might want to deal with. Colorado company Devium wants to make things a little simpler with its sleek-looking car stereo system, the Dash. It's custom-made to fit the iPhone 4 and iPhone 4S, while the complementing app seems geared towards eliminating extra transmitter wires or the need for an external radio. In fact, the only dial on the Dash controls the volume. You can access everything else via the touchscreen on your iPhone, and the stereo system both amplifies the audio and charges the iDevice. Although the project just launched on Kickstarter, the company is reportedly working on more magnetic faceplates that'll fit Android and Windows Phones, so the Dash app interface (Dashboard) shouldn't strictly be an iOS exclusive. 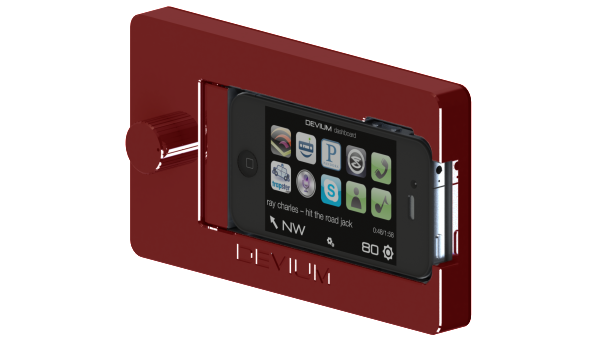 Devium claims that any other app will work natively with the Dash, so you won't have to rely on their custom interface. Plus, no more stowing your iPhone in your cupholders. Keep in mind, you'll essentially be giving up access to whatever radio and satellite hook-up your car has right now, but there's plenty of apps that should make for suitable replacements (Devium recommends iheartradio and the superior TuneIn Radio Pro). Either way, it's a trade-off that should save your dashboard some much-needed space. Just about the only thing you need to worry about are tech-savvy carjackers who might know about the Dash. That $300 stereo system doesn't exactly scream subtlety. And heavens help you if you accidentally leave your iPhone docked in the faceplate.